**All rates are subject to 12% government tax and 10% service charge. **Full payment will be taken within 30 days of the check-in date. **The Oasis at Grace Bay has a strict maximum occupancy policy. Please pay attention to the maximum number of guests allowed per room and reserve accordingly. If your party arrives with a larger party size than the room allows, you will likely need to book an additional room in order to accommodate everyone (subject to availability). If you are unsure or have any questions regarding this policy, please contact the hotel and we will be happy to explain further. By making a reservation with The Oasis at Grace Bay Hotel, you accept the cancellation and no-show (if you do not show up) conditions which may affect your reservation or your stay. Cancellations of reservations can only be made free of charge if they are made 30 days prior to the arrival date; otherwise you will forfeit 100% of the reservation total. No Shows (if you do not show up) forfeit 100% of the reservation total. No credit will be issued due to force majeure reasons. Modification of Reservations: Changes to reservations are subject to availability. No reimbursements or credits will be given in case the customer leaves prior to the period of time he/she reserved. 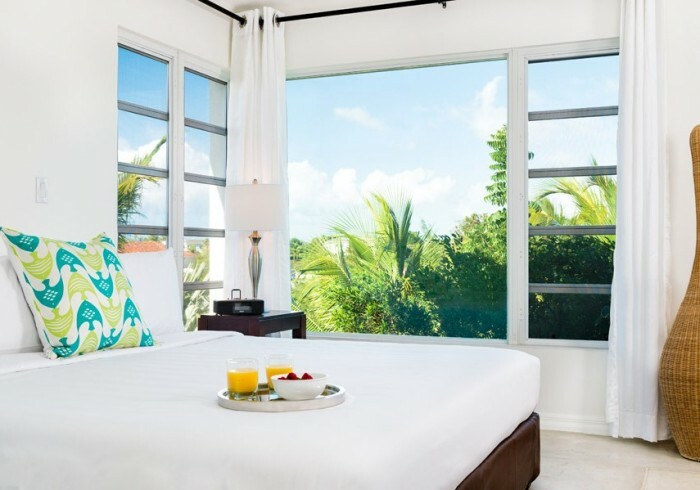 The Oasis at Grace Bay is a contemporary boutique hotel property set in idyllic Grace Bay on the Island of Providenciales, Turks and Caicos Islands. The hotel sits one block back from Grace Bay Beach and offers guests a golf cart shuttle service to and from our beach desk. Suites and Two Bedroom Villas comes with a full size kitchen, washing and drying machine, living room and a spacious exterior balcony looks on the garden and pool. Luxury King studio and Double studio rooms comes with a spacious exterior balcony looks out on the garden and pool. Our friendly and courteous staff are on property twenty-four hours a day to cater to our guests experience with us. Kindly be advised that all rates and reservations are subject to a mandatory 12% government tax and 10% service charge.